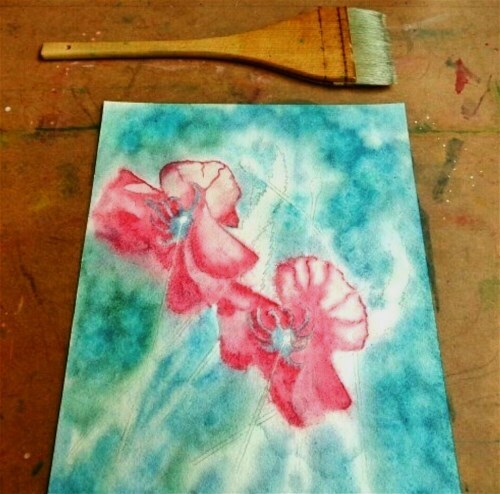 My Stuff: Alla Prima Poppies! All month now we've been talking about well-known & loved artist, Bob Ross. Last week I specifically talked about a painting technique called "alla prima" which Bob used for all of his painting adventures. If you missed it, you can read about it here. This week I did my own version of an alla prima painting, which is also known as "wet-in-wet." 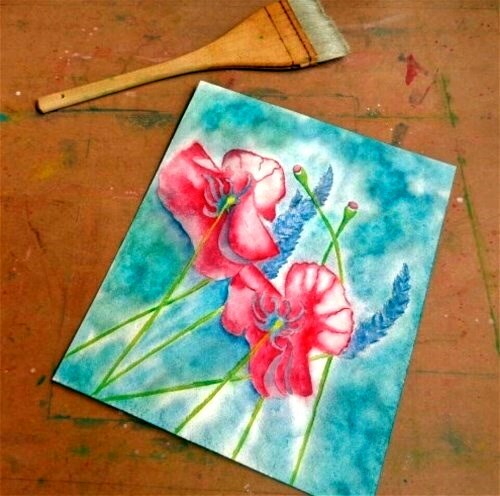 And the subject for the painting is one of my favorites ... poppies! My most favorite of all is my hake brush, the wide brush at the top of the photo. It's a handcrafted Japanese brush made of goat hair - and it is sooooo soft & lovely! This is the brush that I dip into a bowl of water, and before I even start the painting, I use it to completely soak both sides of my paper. 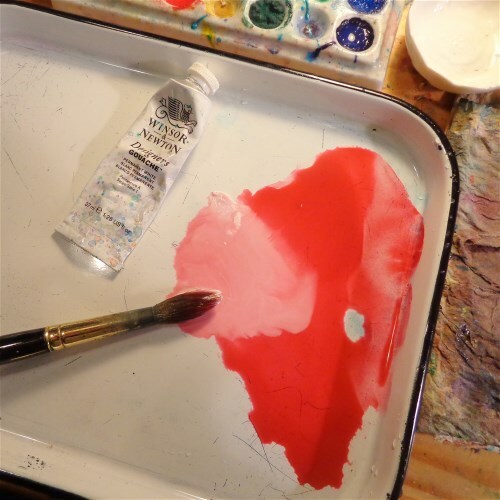 Luckily, a good quality watercolor paper is made of tightly compressed cotton fibers that can withstand a good deal of moisture. 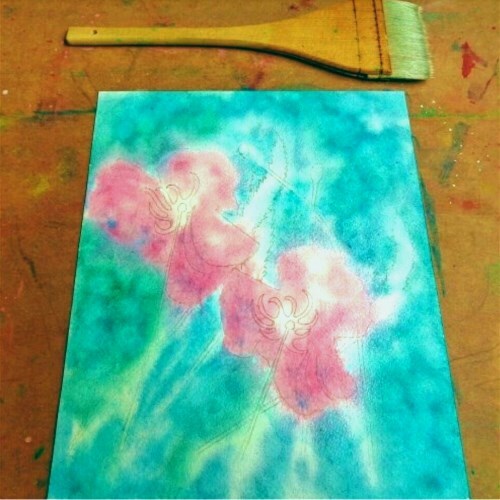 Yes, that's right - watercolor paper is made of cotton rag, NOT from tree pulp. I also use a few tube paints, a bit of table salt for texture, and other brushes & a pencil for the initial drawing. 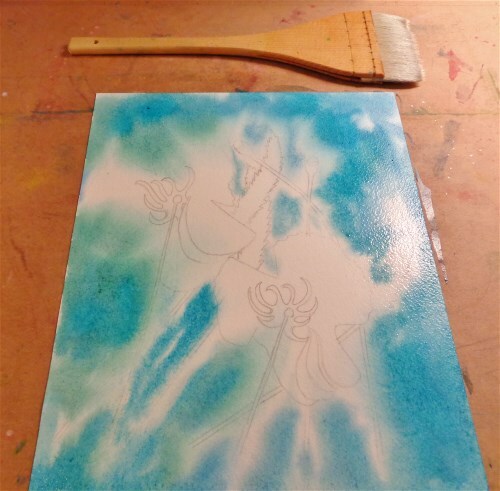 Below is what it looks like after I've completely soaked the canvas with my hake brush & water, and then dab in that first layer of blues & greens on the background. The paint travels along the fibers of the wet canvas, and goes in unexpected directions. If the paint gets too much onto my poppies (you can see some of the green has traveled into the poppy on the left), all I do is scrunch up a facial tissue & dab it off. If some is left behind, it's ok - it will just be darker areas of the flower when I paint over it. No worries! One thing I forgot to include in my tools photo that I shared with you, is my bottle of rubbing alcohol. When I dip my brush in the alcohol & then touch it to the wet paint, it basically repels the paint making interesting little blobs here & there. Can you see them in the background? It helps increase the amount of texture & spontaneity. So the next step is to paint the poppy itself, keeping in mind that I am spraying water on the back of the paper, AND just because they have probably dried a bit, I use a wet brush to apply a little more water to the poppies before I begin painting them. I decided to make the poppies pink, with a dab of yellow to warm the pink up a bit. 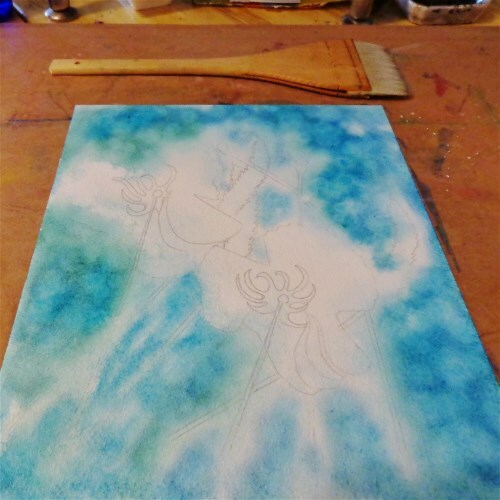 Then to soften the pink & make it more pastel-like, I use a dab of white gouache. For those of you who don't know, gouache is a much more opaque version of watercolor paint, and allows one to use it for different effects. In this case, I used white gouache to make the pink softer & less saturated, which gives it a more subtle effect. Below is what that looks like. You can see on the left where I've added the gouache, that I've gotten a true pink. And where the color on the right that hasn't had any gouache added is very saturated, more of a deep rose pink. Btw ... "gouache" is pronounced "gwash", some say "goowash" :-) However, if you Google - watch out, there are many different opinions on this one! I stick to "gwash". Ok, so below is that first layer of pink applied to the poppies. If it runs into the centers a bit, that's ok. The centers, which I will do later, are darker than the pink, so it'll work out fine. With watercolor, as long as you're working light to dark, you're good. Below I'm beginning to paint the centers, and more detail on the poppy petals. Of course the surface of the canvas is beginning to dry, which allows these kinds of details to be added. If I add them too soon, when the paper is still wet, then the paint will travel into other areas where I don't want it to go. So a lot of painting wet-in-wet is timing. Lastly I work on the lavender, the not-yet-bloomed poppies in the background, the green stems, and add a bit more detail to the poppies. I took the first photo at approximately 12:30 pm, and I took the final photo of the painting at about 3:30 pm. Since I was taking photos of the steps along the way - this added a bit to the overall time. All in all, this probably took about 2 1/2 hours. Not quite Bob Ross time, but still considered "all at once", which is what "alla prima" means in Italian. To compare ... when I do a more methodical painting, where I'm painting in very small steps and then allowing it to dry in between, the painting takes at least 8-10 hours. My larger, more detailed paintings can take 30-50 hrs to complete. This gives you some idea of the time difference between working in alla prima & not. What's really quite ironic though, is that working wet-in-wet takes much more experience & mastery of one's chose medium to accomplish, even though the overall time to paint is quicker. Much more so than the methodical, contemplative approach. So how much time the painting takes doesn't necessarily equate to value. When choosing a work of art for your home or office, none of this truly matters though. What really counts is whether it speaks to you. If you feel a strong (hopefully positive) connection to the piece, it makes no difference how long it took, what size it is, or which particular method was used. What matters most is the feeling or emotion it evokes in you. That's it. 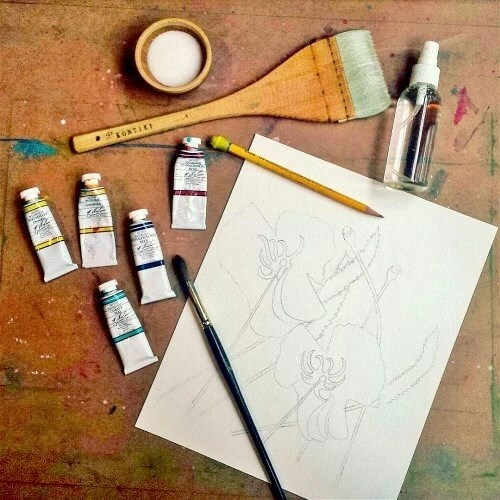 Hope you've enjoyed learning more about alla prima, and getting a glimpse into my painting process.